I just went to google trends and just compared these three JS libraries and the results are stunning. AngularJS and ReactJS gaining momentum over jQuery. When is the last time you worked on jQuery ?. I worked on jQuery project almost 2 years back. From last 2 years, I am working with Angular and React. 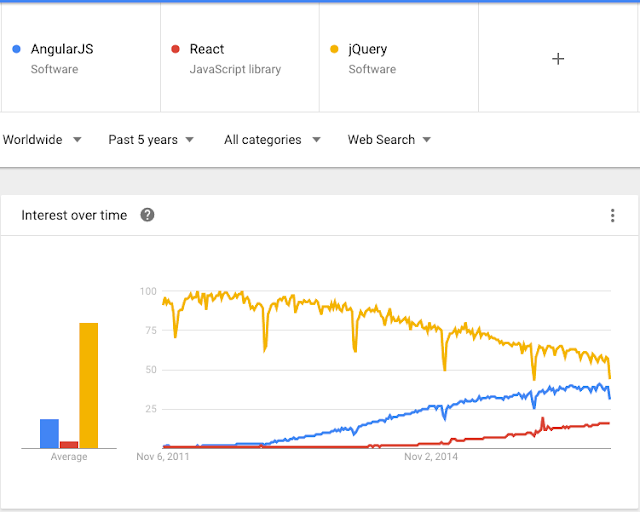 ReactJS and AngularJS are having more followers than jQuery. Now trend is moving towards single page web applications, hybrid apps. jQuery is not good for both. AngularJS and ReactJS gives good performance for single page web applications, hybrid apps. Building feature in jQuery really takes more time than building in React or Angular. In both examples, lines of jQuery code is almost 3 times more than Angular code. Its clear that it will eat developers time.